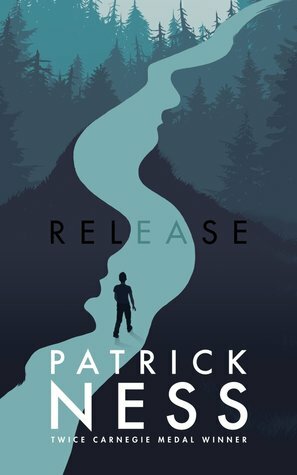 My husband, son, and I all loved Patrick Ness' stunning dystopian Chaos Walking trilogy that begins with The Knife of Never Letting Go (a movie adaptation is due out in March! ), so I jumped at the chance to listen to his latest novel (having missed a couple in-between) on audio. Release is an entirely different kind of novel - realistic fiction - but just as powerful and engrossing. Seventeen-year old Adam doesn't know it yet but today is going to change his life in ways that he can't even imagine. This summer Saturday starts out like an ordinary day for the gay teen who has compartmentalized his life in order to keep it under control. He has a tight schedule to keep if he wants to make it to the "get-together" (his parents don't like him going to parties) at the lake this evening, a going-away gathering for his ex-boyfriend, Enzo. His dad is an evangelical minister, so his family is deeply religious - and being gay doesn't fit in that narrow mold. His older brother, Marty, is the "good boy," who does everything right, though he just might surprise Adam on this unusual day. Adam's boss at the warehouse store is making Adam more and more uncomfortable with his unwanted advances. And Adam has squeezed into his schedule a short rendezvous with his new boyfriend, Linus, who he thinks he loves, in spite of still thinking about Enzo. At least, he always has Angela, his best friend, to rely on and talk to when things get crazy...and today things will get really crazy. The story of this one fateful day is told from Adam's perspective, with lots of dialogue and some text messages between him and Angela to keep things interesting. It's a compelling chronicle, right from the start, as Adam sets off on a day where everything seems to go wrong. It's not a depressing novel, though. Adam has Linus and Angela for support, and in some cases, it's good to finally get things out in the open and release some of the constant pressure he is under. Although there are many serious issues dealt with here, the tone is mostly light, and the author has a great sense of humor (also evident in his earlier novels), so the pace moves along quickly and remains engaging. There is a parallel narrative, stuck in bits and pieces in italics among Adam's story, a sort of supernatural afterlife story that is taking place in Adam's town on the same day. It's confusing at first....well, it remained somewhat opaque to me. In any case, I mostly ignored that secondary storyline and focused on Adam's story, which is the main part of the novel. I immediately liked Adam and his friends, and in spite of it being such a difficult day for Adam, was cheered by an appropriate ending that focused on friendship and love and hope. Sorry - no audio sample available this time because for some strange reason, Audible has what sounds like the Norwegian (?) version of the audio playing! Go ahead and try it if you want to be amused (or speak Norwegian or Danish or whatever it is). Or you can order Release from Book Depository, with free shipping worldwide.